Take two fictional orthopedic surgeons, Cherry Picker MD and Morbidity Hunter MD. Cherry regularly appears on TV. He writes for the sleek, metrosexual publication, FHM. Cherry specializes in knee injuries in weekend warriors. His patients often call him from the ski slopes in Colorado, Whistler and Zermatt. Cherry is good at his craft. But his patients are even better at their craft – post-operative recovery. Cherry doesn’t actively seek such patients. His patients are selected for him by his zip code, reputation, long waiting list and Yelp. Morbidity Hunter’s real name is Harjinder Singh. He migrated from Punjab and works in a safety net hospital in North Philadelphia. Singh wanted to work in Beverley Hills, but to convert his J1-visa to a green card, he had to work in an area of need. Once he started working, he liked his job. His daughters liked their school and his wife liked the house they bought. Singh doesn’t have shiny teeth. He hasn’t appeared on TV, although his daughters tease that he can play Sonny from Exotic Marigold Hotel. Singh is not in for the money. He doesn’t make as much money as Cherry, but makes enough. He doesn’t operate for glory. He operates for professional pride – an ethereal concept that eludes some health economists. It’s hard to zap the morale of this sturdy lad from the Punjab. But the data transparency movement achieved that. He always knew that operating on the sickest, poorest and most disenfranchised section of society was not going to be lucrative. But he never knew he was going to be made the captain of their ship – he was happy to captain the placement of their total hip – but what happened before or after they entered the operating room was not his fault, he felt. People began to call Singh an incompetent surgeon. He objected, but he could not understand the logic behind the numbers which were incriminating him. His complication rates were the highest in Philadelphia. Numbers don’t lie, supposedly. This was too much for him to bear. He didn’t mind losing the pitiful bonuses that CMS was withholding from him, but the reason broke his heart – his poor quality. Singh was puzzled by people who claimed to lose sleep over the poor. The chasm between their sentimentality and actions baffled him. Punjab began to make more sense than Philadelphia. But then Cherry invited Singh to join his practice in New York. Cherry promised Singh that he could operate on technically challenging patients. Grudgingly, Singh accepted the offer, which made his wife very excited about shopping for Indian food in Queens. She insisted, though, that Singh had to see a dentist first. My favorite is Simpson’s paradox – where the conclusions are actually, and precisely, the opposite of what is inferred from the data. That is, for example, when a study shows the superiority of an inferior treatment, and vice versa. The data release by Propublica is a reservoir of Simpson’s paradox. This means when the data says “bad surgeon”, the surgeon might, in fact be a Top Gun – a technically-gifted, Morbidity Hunter – the last hope of the poor and sick. This graph made by John Alan Tucker PhD (@JohnTuckerPhD), an analyst, is instructive. Let’s assume that a complication rate of 2.5 % is the national benchmark of surgeons. Let’s say that a surgeon, Good Enough MD, in reality meets the benchmark. The probability that the data will show a complication rate of 4 % in Good Enough – that is 60 % over the benchmark – is nearly 40 %, if we sample his last 35 procedures. Forty percent! Would you accept that degree of uncertainty for a new statin in the market? Are surgeons more expendable than Lipitor? Chance, it seems, favors the high-volume surgeon. But don’t get too excited. If Good Enough’s last 200 procedures are recorded, the chances that the data will show a 4 % complication rate, when his true rate is actually 2.5 %, are 15 %. This is not as high as forty percent, but hardly respectable. This figure, in which Tucker included the much touted risk-adjustment, is no more reassuring. 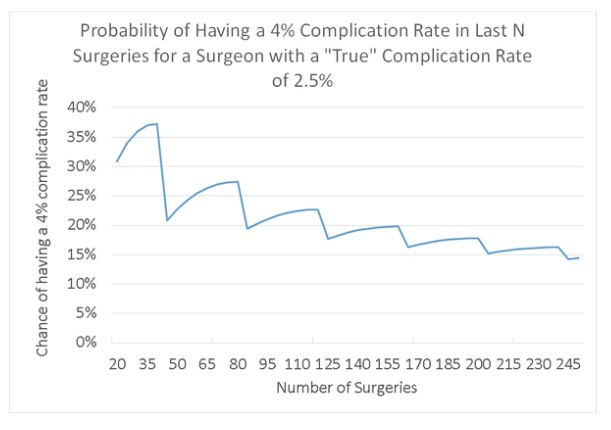 You can see that the complication rates of hip surgeons in California that fall within the 95 % confidence interval. This means that the difference between the nearly worst and nearly best hip surgeon could be the roll of a dice. Of course, that’s not true. The technical skills of surgeons lie in a spectrum. The numbers do not replicate the spectrum. This highlights a curious ethical issue. If a patient has a right to know about a surgeon’s performance, the point estimate, should they not be informed about the methodological limitations of that measurement, the confounders, the confidence interval – which is as large as the elephant in the room? We are at the brink of a revolution in accountability in medicine. We are at the brink of some revolution, or other, a dozen times a day. The future of the transparency movement is bright. The future for patients who need Morbidity Hunter MD is not so good. Harjinder from Punjab won’t look after the poorest and sickest – even for a green card – if you call him a bad surgeon. How Is Health Reform Impacting Insurance Switching Patterns? Looks to me that if the BEST hip surgeon in CA has a complication rate of 0.8% and the WORST has a complication rate of 4.0%, the people in California are pretty damn lucky to have plenty of good orthopedic surgeons. What the heck are they cryin about? Risk adjustment is not perfect, but the question is how imperfect and in which group is this model, and yes it’s only a model, the wrongest? Propublica should let independent group run sensitivity analyses and these should be published. Haven’t you answered your own questions? Re Simpson’s, the data have to be partitioned such that the high risk, obese, diabetic, high sed rate, high CRP, smokers, drug users, high cholesterol, bad zip code folks, blah blah blah are identified and surgical outcomes calculated and shown for just these folks? Then, Dr. Morbidity would shine and Dr. Cherry would be revealed as average or whatever. Re low N statistics, don’t you have to go ahead and tell the patient plus or minus confidence limits whether he wants the information or not? Not sure the consumer is informed about the limitations of methodology – they should be. Marx was right. But he was wrong about who would fight who. It’ll be between the managers and their immediate subordinates. The proletariat have more pressing things to do than fight a revolution, such as subsisting. The fight will be between the managers (read: masterminds) and their immediate subordinates (who lazily assuage their guilt by empowering government to dictate more and more of our lives). The proletariat have more pressing things to do than fight a revolution, such as subsisting … oh yeah, and sitting on the couch watching the Kardashians, Netflix, and ESPN. Panem et circenses. If we will not rule over both ourselves and our government, government and others will rule over us. Paying for outcomes and punishing docs for not avoiding the sick who are also poor, will lead to an interesting cognitive dissonance. I am keen to see how we resolve it. We have nationalized healthcare – it’s called Medicare. I don’t think I’d get the job as a bot! The problem in the media is homogeneity of opinion. It’s a serious problem. Blogs can mitigate it, but only to an extent. Excellent, something that should appear in the lay press over and over again. Every time a good medical center flies someone out to Mayo and keeps those too sick to fly one should think that the ability to fly elsewhere means a higher survival rate for the recipient hospital and a lower survival rate for the hospital that sent the patient.. Thanks. That’s exactly right Allan. Risk is uneven, money is uneven – paying for performance doesn’t even pretend to align the two.